HP Umpire David Rackley ejected Marlins Manager Dan Jennings for arguing a check swing call made by 1B Umpire Hunter Wendelstedt in the top of the 9th inning of the Marlins-Braves game. With one out and one on, Marlins batter Adeiny Hechavarria attempted to check his swing on a 0-2 slider from Braves pitcher Arodys Vizcaino for a swinging third strike. Replays indicate the pitch was located within the bounds of the strike zone (px -.163, pz 1.545 [sz_bot 1.43]), the call was correct pursuant to UEFL 6-2-b-6-a (Quality of Correctness is governed by the (in)correctness of the call made, not by the quality of reasoning given for such a call). At the time of the ejection, the Braves were leading, 6-3. The Braves ultimately won the contest, 6-3. This is David Rackley (86)'s second ejection of 2015. David Rackley now has 6 points in the UEFL Standings (3 Previous + 2 MLB + 1 Correct-Crewmate = 6). Crew Chief Hunter Wendelstedt now has 10 points in Crew Division (9 Previous + 1 Correct Call = 10). 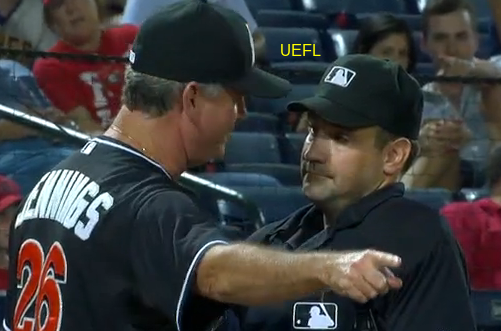 This is the 152nd ejection of the 2015 MLB Regular Season. This is the 69th Manager ejection of 2015. This is the Marlins' 2nd ejection of 2015, 5th in the NL East (WAS 6; NYM 4; ATL, PHI 3; MIA 2). This is Dan Jennings' 2nd ejection of 2015, 1st since June 3 (James Hoye; QOC = N-C [Check Swing]). This is David Rackley's first ejection since April 14, 2015 (Clint Hurdle; QOC = N [Balls/Strikes]).